Today I felt like doing a girly Tilda card! 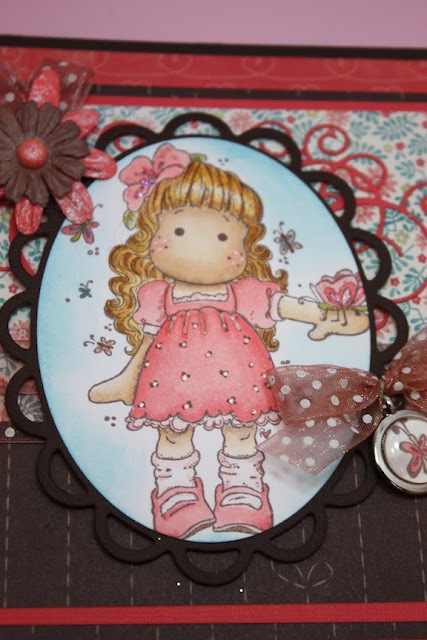 I was inspired by a challenge on the Simon Says Stamp blog. They have a Bingo challenge and I chose charms / punches-diecuts / ribbon-twine. I really love the little charm that you added! Thanks for sharing at MIM! Super sweet card! Beautiful coloring! So glad to have found you through Make It Monday! Saw your card at MIM and loved it. Your coloring on the cute image is fabulous!! KAthy - thanks so much for sharing on MIM. Your colouring is stunning and I love the colour combination and layout of this card - very inspiring. Beautiful!!! Thanks so much for joining us at Simon Says Stamp. Oh this is so pretty! Beautiful colouring on this sweet image, and I love the chiffon bow, and sweet charm. Gorgalicious card, thanks for playing with us at Simply Create Too. Katherine: wonderful Spring card--love it. Thank you for entering Simply Create Too's Challenge #9--"It's Spring???" Don't forget: Our new challenge begins tomorrow [Friday] Friday. So much awesome detail. Saw your project on Make it Monday and had to come over and take a closer look. Gorgeous, love the colors, Tilda is so pretty! Gorgeous card. So lovely design. I like the colors and that image is super cute. Also love the CAS style design like Plastic cards, which make the card POP. Thanks for sharing. Super sweet card! Beautiful coloring!